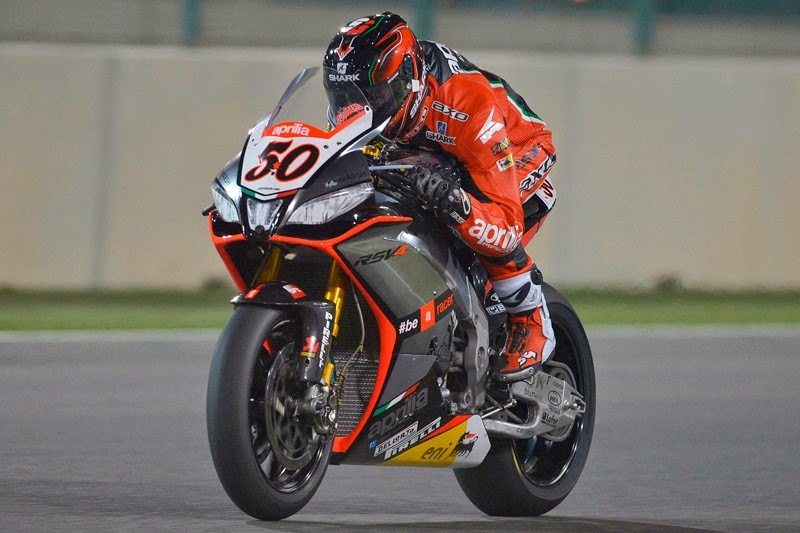 Aprilia Racing Team’s Sylvain Guintoli has been crowned 2014 World Superbike champion following a dramatic evening of racing under the floodlights in Qatar after securing a double win. Davide Guigliano started on pole but it was Sykes who shot into the lead in the first corner ahead of Pata Honda’s Jonathan Rea with Loris Baz not far behind. It was soon a four way battle for the lead, with Kawasaki rider Baz leading the way and clearly not thinking of helping his team-mate Sykes out as Guintoli was keeping up with the leading pack. Mid-way through the race the Aprilia rider moved up into third position ahead of Rea and then had KRT duo of Sykes and Baz in his sights. With four laps to go Guintoli clinched the lead from his compatriot which kept the championship alive as Sykes was battling with Melandri for the final spot on the podium. In the closing laps Sykes was up on his team-mate’s tail in a battle for second position and despite signs on Baz’s pit-board telling him to drop a place in order for Sykes to secure second position the Frenchman ignored the orders, meaning the championship went down to the final race of the season. Starting from the same grid positions Rea again got a strong start going into the first corner but it was Sykes who got the lead as his team-mate ran off track following a coming together with Leon Haslam in the first corner. Giugliano was putting up a fight on his Ducati and he attempted to get in-front of Rea for second position whilst Guintoli was looking on back in fourth. As the riders crossed the line for lap two of 17 Northern Irishman Rea shot into the lead which he kept for the next four laps. By the fifth lap Guintoli had found his pace again in a similar style to race one and took the lead off Rea and from that point he never looked back. Setting a new lap record by the eighth lap it was clear Guintoli was set to dominate the last race of the season and despite Sykes’ best efforts he was unable to catch the flying Frenchman. Guintoli secured the 2014 crown with a lead of three and a half seconds as Rea crossed the line in second position and Sykes completed the podium: “I don’t think its sunk in at all, I can’t believe it! I’ve been picturing this double win all year and I knew I had it in me somewhere but I didn’t know if I was going to find it. Those races were so good, I felt so good riding the bike, I’ve never felt so good riding any bike before. Not only was Rea able to secure two top four finishes in the desert, he also secured third position in the championship as he bids farewell to Honda and his crew chief Chris Pike: “I am really over the moon and I’m so pumped to get 3rd in the championship. My team have worked so so hard to get here with the CBR, I just don’t know what to say. I had tears on the start line, Chris was trying to tell me to calm down but I was really pumped I really wanted it. After some cutting comments made by Sykes following race one’s team-orders drama, branding Baz “immature and disrespectful” the Yorkshire rider was naturally disappointed to have missed out on the championship but seemed gracious in defeat to Guintoli. Click the links for a full list of race one and race two results. Previous Previous post: New Moto2 Champion Rabat: I am so, so happy!